It’s a small world after all, sing the characters at Disneyland. And although most of what Disney purveys is a fairy tale, they are spot-on in this regard. At the end of February, I went skiing in the French Alps. One night we went out to drinks with the friend of a friend who was shortly to travel to South African and wanted to chat to me about restaurants that she should visit. Most of the places she wanted to visit were exactly what I would have suggested, but one totally unfamiliar name cropped up: Ryan’s Kitchen in Franschhoek. I had never heard of it but she assured me that she had been there on a previous trip and that it was definitely worth a return visit – information which I filed under “for future reference”. But not two weeks later, out of the blue, I received an e-mail from (you guessed it) Ryan himself, inviting me to a chef’s table lunch the restaurant was hosting for bloggers. I explained that I’d love to attend, but that it was unfortunately two days after I fly back to London – but I did mention that I had been told about the restaurant recently in the French Alps! And a week after that Ryan tweeted me to say that he was on the terrace having a drink with my acquaintance from the French Alps. Small does not begin to describe it! 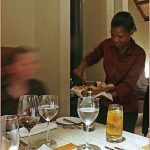 When a slot in my busy SA trip schedule unexpectedly opened up, I leapt at the chance of visiting the restaurant in the sparkling company of two of my oldest blog friends Johanna and Kit. I had been told that I may as well forget about getting a table but as Ryan explained, the restaurant is predominantly a dinner destination, so if you can get to Franschoek for lunch like we did, you will probably get a table relatively easily. Situated in the Rusthof guest house on Main Road, Franschhoek, the restaurant is remarkable for its small size, seating only about 50 people in the cosy indoor and terrace areas combined. All the indoor tables have a view of the gleaming open-plan kitchen where you can see Ryan’s calm demeanour an hands-on attention to detail as you dine. Ryan Smith is a native Capetonian who has trained and worked all over the world, including France, the UK, the USA, the middle-East, Russia, as well as a stint on international cruise ships. When he returned to South Africa to open his restaurant, he was determined to serve modern South African cuisine, driven by seasonal, indigenous ingredients with local historical and cultural references, but with modern international flair and ingenuity. The end result is a fusion of European ideas and South African ingredients, with a detour through a Heston Blumenthal-style laboratory. As it was 35C on the day of our visit (!) we chose to sit on the terrace to take advantage of whatever breeze there was. The menu is the same for lunch and dinner and features both a small a la carte selection (3 starters, 3 mains, 3 desserts) at R255 for 2 courses or R325 for 3 courses; as well as their 7-course Taste of Africa tasting menu (R450 without matching wines or R650 with matching wines. The wine list features a number of wines from local Franschhoek estates and prices start at R90 for a bottle, running all the way up to R500 for a bottle. 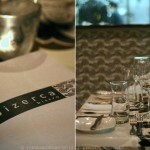 There is a good selection under R200 as well as about a dozen wines by the glass. I started with a glass of Moreson Miss Molly sparkling wine and shared a bottle of Mulderbosch Chein Blanc. Let me say from the outset that the food at Ryan’s Kitchen is probably not going to be to everybody’s taste. If you are a meat and two veg kinda guy, or can’t be dealing with foams and frozen soups, the you will probably be happier elsewhere. But if you are a sucker for a little bit of food theatre like me, then you will be in your element. The first sign that this is no ordinary winelands restaurant is the arrival of the amuse bouche platter. These beautiful individual bamboo platters came laden with a spicy tomato foam topped with a crisp basil leaf; a slim tube of butternut and ginger juice; a cheese and potato puff on spicy tomato cream; and a larger test tube of frozen basil juice, furiously foaming and trailing wisps of “smoke”. My favourite was the little dish of spicy tomato foam which was light, intensely tomatoey, and as light as a feather; closely followed by the cheese and potato puff. The butternut and ginger juice was intensely-coloured and flavoured and I loved drinking it through a straw. But although the frozen basil juice was visually the most impressive, it was the least exciting, taste-wise – just cold, salty and deeply basil-flavoured. Still, it was an impressive start to the meal, setting the tone for what was to come. As a starter, I chose the tuna carpaccio with apple and leek roulade, Autumn greens and grated lime. This was not only beautifully presented but also a surprisingly generous portion of fish, under a blanket of cress, cucumber and green apple matchsticks, sprinkled with the dried grated lime with a cucumber granita on the side. What I loved about this dish was that it really let the flavour of the excellent fish shine through, rather than overwhelm it with dressings of other strident flavours. The apple and cucumber provided a lovely crunchy counterpoint to the yielding fish, and the unusual apple and leek roulade was subtle and delicious. The other popular starter at our table was Cape Malay curried pickled fish done Ryan’s way. Ryans take on this very typical and uniquely South African dish involved chunks of the perfectly pickled fish on one end of the plate, crunchy pickled baby vegetables on the other end and in between, a sugar and seaweed cannelloni – a crunchy sugar tube the colour of nori seaweed, filled with gently seaweed-flavoured espuma. I thought this was a pretty brave dish – not every diner will be doing handstands of delight at the thought of the sugar/seaweed combination – but the usually sceptical Nick was intrigued by it. I thought the pickled fish was heavenly, although I must confess to not being convinced that the sugar tube and seaweed combo worked. I did love the visual appeal though. For mains, it was another two-horse race at our table: half of us (including me) ordered the linefish, hot smoked with smoked potato puree, pancetta wafers and braised baby fennel. The fish of the day was seabass, but if we were expecting the fish itself to be hot-smoked, we were in for a surprise. Our fish arrived under gorgeous individual glass cloches, hazy with smoke – from burning barrels, as we were later told. As the cloches were lifted, we got the unmistakeable aroma of woodsmoke – possible one of my favourite and most evocative smells in the world. I was already smitten. The silky potato puree did indeed hold the lingering undertone of smoke; the fish was just cooked to the point of opaqueness and took on the smoke flavour of the pleasingly crisp pancetta; and the baby fennel was cooked to the point of caremalisation where the aniseedy flavours morph into something altogether more mellow and quite exquisite with the fish. Quite possibly one of the best fish dishes I have ever eaten. The rest of the table (i.e the boys!) opted for the springbok shank, sliced springbok loin, black peppercorn and pumpkin purees; and confit mooli. My first impression was that I have seldom seen more beautifully cooked loin – perfectly pink almost all the way through with a seared exterior, but it was the meltingly tender shank that truly blew me away, slow-cooked to a rich, concentrated, almost caramelly depth of flavour and fork-tender. The purees were richly flavoured and worked well with the slightly peppery loin – and llike all the dishes, the plating was meticulous and beautiful. The dessert selection comprised two sweet desserts and a cheese selection – and in the interests of scientific research we ordered all of them! I did not try it, but the caramelised pineapple galette with granadilla Chantilly and ganadilla parfait looked heavenly, especially the perfectly caramelised chunks of pineapple. I shared my dessert with Johanna: plum textures comprising a roasted plum, plum mousse, plum jelly, plum cassonade and nut brown-butter ice-cream. This was a great combination of flavours and textures, centred on the theme of seasonal plums. The jelly, the mousse and the roasted plum all retained a pleasing tartness, while the cassonade added both a caramelly sweetness as well as a contrasting crunch – and I loved the plating. I also shared the cheese selection (not pictured) with Johanna, which included beetroot Cheddar; Camembert; cumin Boerenkaas; Gorgonzola; and Huguenot Cheddar, accompanied by turmeric pickled cucumber, beetroot, yoghurt and baby onion compote. The cheese course was the least impressive of the dishes we had (although I did love the turmeric pickled cucumber), although perfectly adequate. Maybe it just suffered by comparison! And then with our coffee, just when we thought we could not eat anything else, arrived some rather spectacular petits fours – in fact, if you skipped dessert, there is more than enough sweetness to keep you happy! First up I tried the chocolate malva puddings with beetroot caramel. These were about the size of financiers, with a channel in the top for the vividly-coloured and earthy-flavoured caramel. I loved this take on malva pudding that traditionally gets soaked in a caramelly sauce. Another big hit was the rooibos tea jelly with a lavender custard and crumble topping. The jelly was deliciously un-sweet and had a strong flavour of rooibos tea, while the custard added a creamy floral note. The carrot cake “Turkish delight” consisted of jelly cubes the consistency of Turkish delight, but with the carrotty, cinamonny flavours of carrot cake. The general consensus was that this was a brave experiment, but not an improvement on traditional Turkish delight flavours. Still – the whole selection made for an impressive and substantial plate of petits fours and a wonderful end to the meal. The front of house is very ably handled by Lana, Ryan’s wife, and service was smooth and professional throughout. Ryan himself came out to chat to us after the service and is personable with a hugely infectious enthusiasm for food. His attention to detail was evident in every plate, and I was very impressed by his unusual and assured cooking style. I have long said that we need more chefs willing to cook South African classics with a modern European twist. Although Ryan’s creative expermentation may not always be to everybody’s taste, I loved the fact that he is trying something a little different in the Franschhoek, arguably the South African home of classic French cookery. And as I found out during another meal on this trip, there is no substitute for an engaged and hands-on chef patron who is cooking his own food in his own kitchen. My verdict? Go now, before the world outside Franschhoek finds out about this treasure. Disliked: nothing – at worst, the cheese plate was uninspired. This post is part of a series called Sundays in South Africa. The series started as a way of providing visitors with some ideas of what and where to eat during and after the FIFA World Cup 2010 which took place in June/July 2010 in my home country of South Africa! Although the tournament is over now, I still try to post a review of somewhere South African, or a South African recipe on Sundays as culinary inspiration for visitors. Click here for previous posts in the series. wow beautiful photos of delicious looking food. makes my mouth water! I visited Franshoek in 1997 – travelling from Saudi Arabia. I thought I was in heaven – French restaurants alternating with antique shops. I even remember the name of the restaurant where we ate – Le Ballon Rouge. 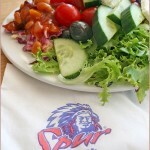 The food was superb and the service, everywhere we went in the Cape, unbelievably friendly. You’ve brought back happy memories and a wish to return some day – maybe even to Ryan’s Kitchen. great venue for meeting up with kit and if i ever am passing by franshoek again, i will definitely book one of their beautiful guest rooms! Oh what I wouldn’t give to eat there after seeing all that! Craving some of that ginger butternut juice now, I might have to try and make something like that. How I love Franschoek! I always said I wanna get married there some day;) My favorite restaurant was Haute Cabriere, those wines……..
Have never heard of (or been to) Ryan’s Kitchen, but it looks perfect. Definitely something I need to try if I ever visit Franschoek again! Great overview and pics of this truly fantastic foodie spot in Franshhoek. The food here looks absolutely beautiful, got me very hungry! I’ve heard a few recommendations of Ryan’s Kitchen myself but this has got me really wanting to go now! He also sounds like a really nice guy! Certainly some food theatre there! Wonderful presentation beautifully captured by you I should add. I want to go! Love the commentary. When I was little I got stuck in “It’s a Small World” in CA. It felt like we were in there for hours. Of course, it turned out to be one of my children’s favorite rides of all time. In the interest of scientific research HA HA HA! Love it! And I love small world surprises like your story and I have noticed that in the world of food I have been involved with so many of those “small world” coincidences! And wow I know where I’ll be eating if and when I get back to CT! The food looks stupendous! Gorgeous, crisp, bright and the flavors sound amazing! A grest review. Those dishes are magnificent and so tempting. A wonderful restaurant.